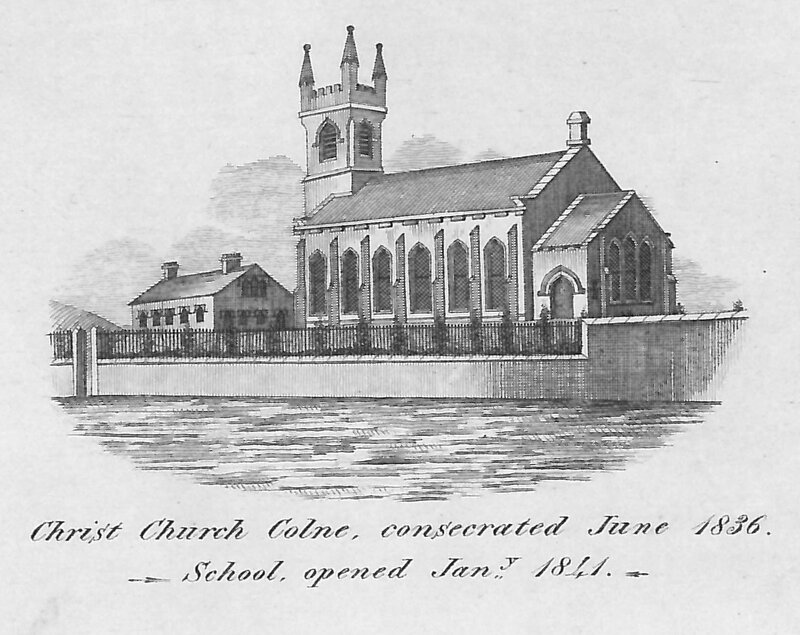 January 2016 will see the 175th anniversary of the opening of Colne Christ Church School. With a strong determination to bring the word of god and a basic general education to the children of the poor in that part of the town, along with lots of arm-twisting and some measure of emotional blackmail, the second incumbent of the church, Reverend William Hodgson, succeeded in raising the funds necessary for a schoolroom. Money, or lack of it, was the constant challenge for Hodgson, and though January 1841 saw the school open, he found himself without the money for a teacher. Undeterred, Hodgson taught the classes himself and spent the next few years drumming up support for his new school and trying to secure the funds for a full time teacher. During this early period, the future of the school was far from certain. William Hodgson had arrived from Haworth a few years earlier. There, on 25 Dec 1835, he had performed his first duty, a burial, as curate to Patrick Bronte in Haworth. He was Patrick’s right hand man until May 1837 when he signed the registers as curate for the last time and crossed the moors to become Vicar of Christ Church. Within a few months of arriving in Colne, Hodgson, tired of teaching children in the church, wrote to Reverend Joseph Wigram MA, secretary to The National Society about the poverty of the area, his ambition to build a school and with a request for money. I find myself under the necessity of making an application to the National Society of pecuniary assistance in the erection of a Church Sunday and Daily-School Room; for the obtaining of which I respectfully request you interest and instructions. We have already collected about 200 children, but having no School-room, we are obliged to teach them in the Church, which on many accounts is very inconvenient, especially because in our narrow pews I find it impossible to put the National System of Teaching, of which I highly approve, and to which I have long been accustomed, into operation. The Church, to which I have but lately come, and of which I expect, under the blessing of God, soon to be Incumbent, has been only twelve months open for Divine Service since its erection; and is in a Chapelry of 20,000 souls. There are but three Church Sunday School in the whole Chapelry. The children of the first are taught in the Grammar School, of the second in a room provided by your Society for that purpose [Colne National School]; and my children (the third) are taught in the Church. The number of children in these three schools will not amount to 600; leaving the remaining thousands to grow up in the wilds of ignorance, or to stray and be led in the paths of schism. Judging from the local situation of the Church, and other circumstances, it is probable that, had we a convenient room for a good system of teaching, we might have not fewer than 500 children; however, of a certainty, we should be justifiable in providing for 400. James Wilson, Esq. Who gave ground for the Church, offers land from the same estate for the School. But as the wealthier inhabitants had to subscribe for the erection of the Church, and are daily called upon to contribute towards the maintenance of unemployed operatives, I have no hope at present of pecuniary assistance from them. From an estimate which I have obtained, it appears that about £300 would be required, a grant of which from your honourable Society would confer upon us a lasting obligation and an inestimable benefit. This entry was posted in church, images then, school, special occasions and tagged brontes, colne, haworth, history, school log books. Bookmark the permalink.